Cuisine is often grouped by region, but the traditional food that is associated with any particular region is usually just a small sampling of the foods that are popular in those areas. For example, Italian food is often thought to consist of mostly pasta, but Southern Italians eat a huge assortment of seafood while Northern Italians often focus on game meats such as rabbit and boar. To dilute a region's cuisine to a small selection of dishes is a disservice to the culture and region as a whole. The most common source of regional cuisine confusion is the huge, encompassing culinary term, Asian food. Asia is the largest continent in the world, and is made up of hundreds of different regions, countries, and subcultures. Therefore the term Asian food is often considered to be too broad by most culinary experts and is often broken down into the following regions. First there is Eastern Asian cuisine that includes Chinese, Japanese and Korean food. Then, Southeast Asian cuisine, which includes Thai, Vietnamese and Malaysian food. Next is Central Asian cuisine, that includes Tibetian, Mongolian and Kazakh food.. Then, South Asian cuisine which encompasses many varieties of Indian, Bangladeshi and Pakastani food. Finally, there is West Asian cuisine, which is more commonly known as Middle Eastern food. If you plan on opening up an Asian restaurant, then you may very well be considering some variety of Eastern Asian cuisine, Southeast Asian cuisine or South Asian cuisine. There are quite a few differences between these foods, and you may either choose to include a broad sampling of more than one region, or stick to a specific region and offer a variety of dishes native to that region. Whatever your choice, understanding regional Asian cuisines and their characteristics is an important first step. While Chinese food is widely varied because of the enormity of the nation of China, this cuisine type typically features steamed rice, beef and chicken dishes with sauce and vegetables, as well as different types of soup and noodle dishes. 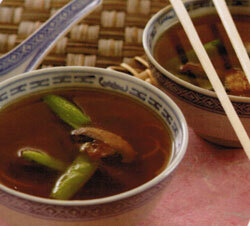 Common Chinese cooking styles include Szechwan, Cantonese and Hunan, just to name a few. Sushi and sashami are but two of the most popular food types offered in Japanese cuisine. Each uses a lot of fresh fish and rice, components that are abundant in Japan. Teriyaki is also a popular Japanese cooking style in which foods are broiled or grilled while being basted in a sauce made out of soy sauce, mirin and sugar, also known as Teriyaki sauce. Korean foods are typified by their use of rice, vegetable and meats cooked in a wide variety of sauces, sides and spices. Some favorites include Kimchi, a fermented and spiced vegetable dish, and Tteokbokki, steamed and sliced rice cakes cooked with fish cakes. Also popular is the Korean barbecue "pulgoki", which is meat marinated in a sauce made with soy sauce, garlic, sugar ,sesame oil ,and other seasonings, and cooked over a fire in front of the diners table. Thai food is characterized by fresh ingredients and a whole lot of spice. Pad Thai, one of the most popular Thai dishes, pairs the flavors of bean sprouts, peanuts, lime juice, and an assortment of spices. Thai food usually features fish, chicken, or even pork as the major meat component of the dish. The most popular flavor component in Indian food is, without a doubt, the exhilarating and widely varied spice known as curry, used to spice stews, soups, vegetables, rice and other dishes. Unlike other Asian foods, Indian food is very carb heavy and uses different breads such as Chapati, Puri, Paratha and Nan among others. These are often served alongside stews and soups. Understanding different Asian cuisines will help you select the menu for your Asian restaurant and decide whether you will specialize in a particular region or give your guests a whirlwind experience of the entire Asian continent.